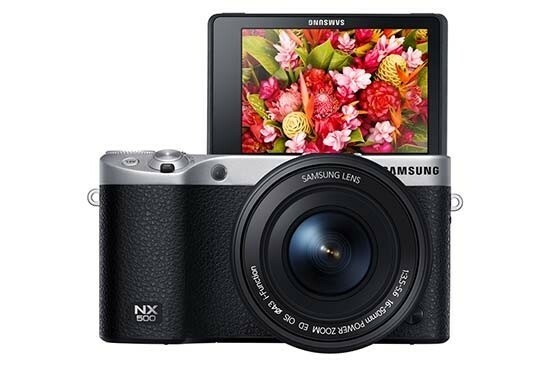 The Samsung NX500 is an affordable new 28 megapixel compact system camera that offers 4k video recording. The rangefinder-like NX500 features a 28.2 megapixel APS-C BSI CMOS sensor with no optical low-pass filter, both 4K and UHD video recording, DRIMeVs image processor, 9fps continuous shooting, a 3-inch tilting/flip-up FVGA Super AMOLED touchscreen, ISO range of 100-51200, Auto Focus (AF) System III with 205 Phase Detection AF points and contrast detection, AF speed of just 0.055sec, top shutter speed of 1/6000th second, Wi-Fi, Bluetooth and NFC connectivity, and support for Samsung's unique i-Function lenses. Available in Black, White and Brown, the Samsung NX500 retails for £599.99 / $799.99 with the 16-50mm f/3.5-5.6 OIS power zoom kit lens. Note that Adobe Lightroom is not supplied with the NX500, as with some Samsung CSCs. 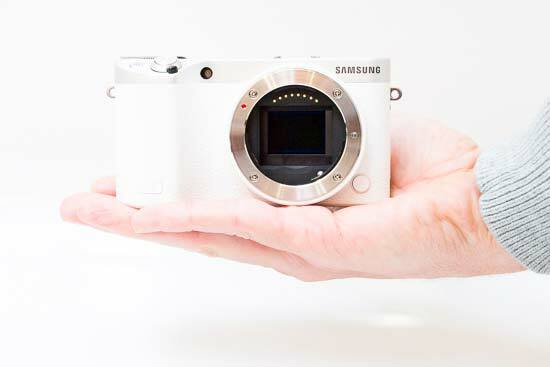 Samsung have combined the core specs of the flagship NX1 camera with the much more compact, lightweight design of the older NX300 model, which the new NX500 now replaces in Samsung's range of compact system cameras. First impressions of the NX500 are positive given the relatively modest price tag, with good build quality that we've come to expect from recent Samsung compact system cameras, although most of the buttons are again plastic rather than metal. 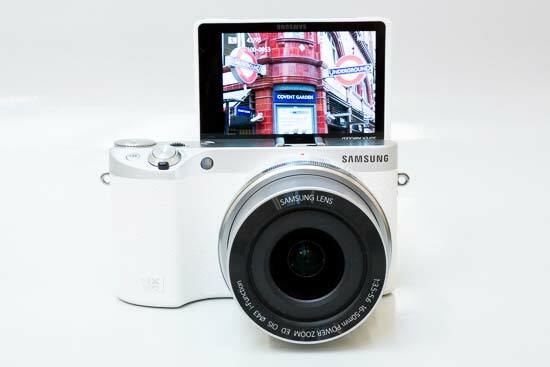 The Samsung NX500 has a polycarbonate body, a brushed aluminum top plate and a metal lens mount. It has a functional look with a two-tone white and silver colourway on our review sample, sharp edges and a tactile curved handgrip on the front that has a faux-leather textured area which runs around the front and rear of the camera. There's a smaller area on the back with a pronounced raised lip for your thumb to sit. At 119.5 x 63.6 x 42.5mm the NX500 is about the same size as its predecessor, and the same weight at 287g for the body-only. Once again there's no viewfinder or built-in pop-up flash, and while beginners probably won't notice the lack of an EVF, being more used to holding a camera at arm's length than holding one up to their eye, they will undoubtedly miss having a flash, while the reverse is probably true for more experienced photographers. Flash is provided for by a supplied accessory (SEF-15A) which slots into the hotshoe on top of the camera, but this adds to the bulk of the camera and obviously isn't as well integrated as some of its main rivals. Still, at least you can leave it at home if you don't need it. We tested the NX500 with the Samsung 16-50mm f3.5-5.6 Power Zoom ED OIS lens, which has the built-in i-Functionality, a metal mount and more crucially optical stabilisation, important as the NX system doesn't offer in-body stabilisation. It's also smaller and more compact than the 18-55mm kit lens that shipped with the NX300. Samsung's now standard i-Function button is present and correct, an innocuous looking button on the lens barrel which when pressed activates a sub-menu of key options and allows you to change them simply by turning the focus ring. Consecutive presses of the i-Function button moves through the four available settings - shutter speed and/or aperture, ISO, exposure compensation, and white balance. While the i-Function button does provide a quick way of accessing certain key settings, we can't help feeling that the idea is best suited to a camera with an electronic viewfinder where you can hold it up to your eye, press the button and turn the focus ring with your left hand, and grip the camera with your right. Holding the NX500 at arm's length to view the settings while pressing the i-Function button and rotating the focus ring just seems a little cumbersome, especially when you can also use the rear control wheel to perform the same actions, something that we found ourselves doing by default. As with all current Samsung cameras, optical image stabilisation is supplied via the lenses, rather than being built-in to the NX500's body. 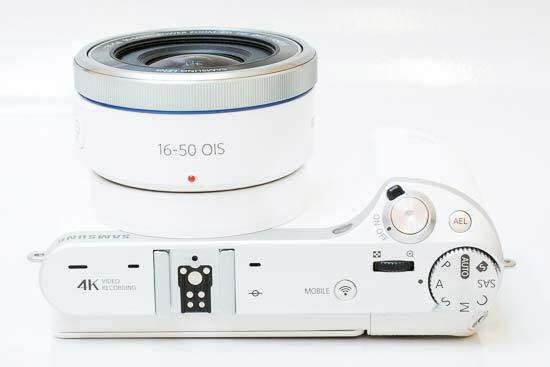 It can be turned on and off either via the OIS menu option, or via a more handy switch on the lens barrel, with two different modes available. When enabled, the NX500 automatically compensates for camera shake, which is a slight blurring of the image that typically occurs at slow shutter speeds when the camera is hand held. In practice we found that it does make a noticeable difference. You don't notice that the NX500 is actually doing anything different when anti-shake is turned on, just that you can use slower shutter speeds than normal and still take sharp photos. On the front of the Samsung NX500 is a small focus-assist and self-timer indicator lamp, round plastic lens release button, and the metal NX lens mount which protrudes out from front of the camera. Located on the bottom of the camera is the shared SD / SDHC / SDXC memory card slot (note that the NX500 supports UHS-I cards, but not does not include UHS-II) and battery compartment, protected by a plastic lockable cover. The BP1130 (1130mAh) battery provides up to 400 shots under the CIPA testing standard. Note that the NX500 only supports in-camera battery charging via USB, rather than using a separate battery charger. Also found on the bottom of the camera is a metal tripod mount which is commendably located in-line with the centre of the lens. Large metal neck strap eyelets are located on top of the NX500 at the sides, with the left one rather annoyingly located on the actual grip, which digs into your forefinger a little when pressing the shutter button. The rear is dominated by the tilting 3 inch AMOLED screen. On the right hand side of the body is a plastic cover that houses a USB 2.0 port and an HDMI port for connecting the NX500 to a HD television or monitor. The USB port can be used as a remote socket for use with the SR2NX02 remote shutter release. The NX500 uses the same built-in dust-removal system as the original NX100 and NX10 models, which vibrates the sensor 60,000 times per second to remove any unwanted specks from appearing in your images. By default this feature is turned off, something of an oversight by Samsung, so make sure to enable it so that it works every time you start-up the camera (it only takes about one second). You can also perform a manual sensor clean at any point. 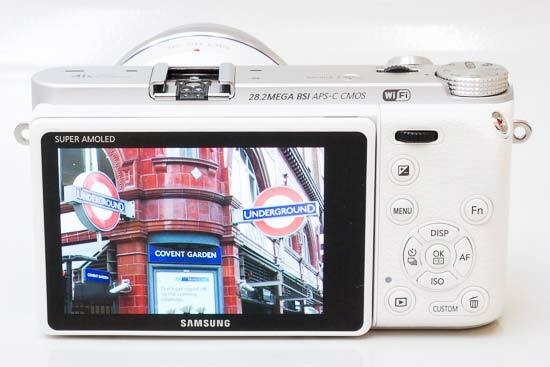 The NX500 has a hot-shoe that will accept compatible Samsung flashguns. Also found on top of the NX500 are two microphone ports for the stereo sound and a larger one for the built-in speaker, a small rotating dial for setting the shutter speed and zooming into and out of images during playback, a tactile shutter button encircled by the on/off switch, and a new Auto-Exposure Lock (AEL) button. The renamed Mobile button can be configured to quickly access the camera's wireless connectivity options. By default it accesses the built-in wi-fi, with an array of options available. Users can email their images, upload them directly to Facebook, Picasa, Photobucket and YouTube, or instantly copy them to a home PC via Auto Backup. Samsung’s AllShare Play and Microsoft's SkyDrive cloud services provide free storage space that's accessible by anyone with an account. MobileLink allows you to directly send images to a compatible smartphone or tablet, while Remote Viewfinder utilises a smartphone as a live image previewer. Finally TV Link takes the place of a physical HDMI connection by playing back photos on any device that's connected to the same wireless access point as the camera. The NX500 also follows in the footsteps of the flagship NX1 by featuring built-in Bluetooth 3.0, which although slower than wi-fi to transfer files, is a lot simply to establish a connection with another device. The NX500 also supports NFC (Near Field Communication) technology (the same technology that's used for mobile payments), which allows you to connect it to a compatible internet enabled device or another NFC-enabled camera by simply tapping them together. There's a traditional round shooting mode dial with a positive click for the different exposure modes located on the far-right, which is a typical feature of DSLR cameras and enables you to quickly change between the various options. The usual selection of Program, Aperture Priority, Shutter Priority, and Manual are available for the more experienced photographers, the more beginner-friendly Smart Auto and SAS (Samsung Auto Shot) modes are also accessed via this dial, and a new C customizable preset shooting mode. Smart Auto is Samsung's equivalent of the intelligent auto modes now found on most competitors models. You simply point the NX500 at a scene or subject and the camera hopefully recognizes it from 16 commonly used presets and automatically adjusts its settings to deliver optimum results. This means that it's not necessary for the user to manually delve into scene modes to call up the likes of 'landscape' or 'flower', essentially making the NX500's operation merely a case of point and shoot. In practice the Smart Auto system works very well, with the NX500 usually picking the most appropriate combination of settings for the current situation. Obviously not all situations are covered by the scene modes that the system uses, but it does work for the majority of the time. It makes it possible for the less experienced photographer to easily take well-exposed, sharp pictures of people, scenery and close-ups by simply pointing and shooting the camera and is more intuitive than the traditional scene modes (which are still available via the Smart Scene option). The NX500 can record both 4K (4096x2160 at 24p) and Ultra HD (UHD) (3820x2160 at 30p) video that's saved on to the SD card, rather than having to be connected to an external storage device, as on some compact system cameras, plus there's full HD 1080p 1920x1080 at 60/50/25/24fps. Unlike the NX1, however, the 4K mode is achieved by cropping the middle 60% of the image from the camera's 6.5K sensor, which drastically changes the effective focal length of the attached lens, instantly making it more telephoto. What's more, the NX500 doesn't have a dedicated Movie shooting mode, so it won't display the 4K crop in live view until you press the Delete button to access the Movie Standby mode, and as it's name suggests, you have to press this button every time you want to record a 4K movie (if you need the preview). The NX500 should really just display the right view if 4K is selected without having to require such regular intervention by the user. The NX500 uses the brand new H.265 HEVC Codec, which runs at 40Mbps and compresses video to half the size and bit rate of H.264 footage at 100Mbps without compromising on the quality, but comes at the cost of compatibility issues with some services e.g. YouTube, and currently can only be natively edited using Samsung's software. There are two compression options, Normal and HQ, with the NX's Pro setting notably missing, which means that the NX500 has a maximum bitrate of just under 50Mbit/s. The mini-HDMI socket provides a clean 1080p output, but sadly not also 4K, although you can at least stream 1080p whilst recording 4K. Stereo sound is recorded during video capture via the small internal mics on the top of of the camera, complete with an onscreen Audio Level Meter and adjustable input levels, but notably there's no standard 3.5mm microphone input for higher quality audio capture or a headphone jack, which will almost certainly push pro videographers to the NX1. The NX500's movie mode offers full control over ISO speed, metering, white balance, timer settings and exposure during video recording via the Program, Aperture Priority, Shutter Priority and Manual shooting modes, and all of the various Smart Filters and Picture Wizard settings can be applied (and the selective color options too). Multi-Motion recording can either slow down (by 0.5x or 0.25x) or speed up (by 5x, 10x or 20x) the video, the quality can be set to Normal or High. Three auto-focus modes are available - single, continuous and manual - and there are three manual focus assist options to help you achieve accurate focusing. Finally, the optical image stabiliser also works for video recording as well as stills. The NX500's 3-inch, 1037k-dot rear LCD touchscreen is also very impressive, incorporating AMOLED (Active Matrix Organic Light Emitting Diode) technology that provides a number of key advantages over traditional LCD screens. These include easier viewing in bright sunshine and a very wide viewing angle, 10,000 times faster refresh rate than conventional LCDs, less power consumption and a high contrast ratio of 10,000:1. One plus point in the NX500's favour is that the screen can be flipped-forwards through 180 degrees to make the ubiquitous selfie even easier to take, plus downward about 45 degrees, although it's a shame that it doesn't also tilt out to the side. The NX500's touchscreen can be used for a whole multitude of things, including accessing the Main menu and Function menu options, setting the AF point, and even firing the shutter. The Touch AF mode offers a very clever feature that we haven't seen before on any other camera. You touch the subject to set the point of focus, and can then drag a second box across the screen to where you want to meter the exposure from - very clever. Finally, you can drag down from the top of the screen to see a summary of the camera's main settings (screen brightness, storage, battery level and recently changed camera settings). To the right of the AMOLED is a familiar round navigation pad with four buttons above and two below. Starting at the top are handily placed buttons for instant movie recording and setting the exposure compensation, then the self-explanatory Menu button. Joining these controls is a very welcome new rear command dial, which in conjunction with the front mounted one makes it easy to use the camera in the more advanced shooting modes - this is a big improvement on the previous NX300 model. The fourth button is the useful Fn, which now provides quick and easy access to virtually all of the most important camera settings (12 in total) via the very useful Smart Panel. This is an intuitive graphical interface that allows you to move around and choose the main camera settings via a combination of the AMOLED screen, the navigation wheel and/or the shutter speed dial on top of the camera. Used in combination with the four directions on the navigation pad that set the Display, which cycles through the various display modes on the AMOLED screen, Auto-focusing mode, ISO and Self-timer/Drive, you can access most of the NX500's key options with one press of a button, although changing them takes a couple more presses. The main menu system on the NX500 is very straight-forward to use. There are four main menus - Camera, Movie, Custom, and Settings - presented as a column of vertical icons, and due to the large AMOLED screen and restricting the number of on-screen choices to five, the various options and icons are clear and legible. If you have never used a digital camera before, or you're upgrading from a more basic model, reading the easy-to-follow manual before you start is a good idea. Unfortunately Samsung have chosen not to supply it in printed format, so you can't carry it with you for easy reference. 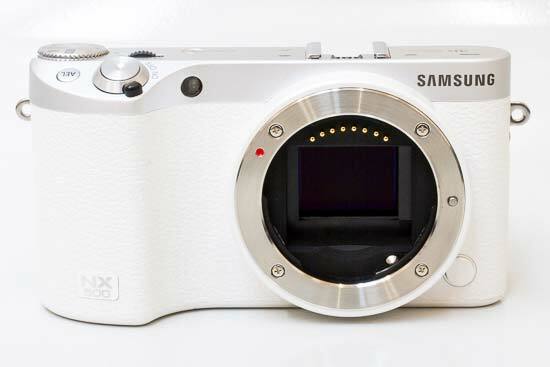 The Samsung NX500 features the same sophisticated Hybrid Auto Focus (AF) systems that's used by the flagship NX1. The AF System III combines phase- and contrast-detection autofocus methods to deliver an auto-focus system that's even snappier and more accurate than the NX30 camera, thanks to the 205 phase-detection (153 cross type) and 209 contrast AF points which combined together cover almost the entire image frame, making tracking moving subjects easier. With a very quick AF speed of just 0.055sec and a fast continuous shooting rate of 9fps for up to 40 JPEGs and 5 RAW files, the Samsung NX500 is a very quick performer. There are four AF Area modes on offer, including Selection AF with a selectable focus area, Multi AF, Face Detection, and Self-Portrait, with Single, Continuous and Manual AF Modes available. Selecting an individual AF point requires you to press the center button on the navigation pad, and then use the arrow keys to move the point around - we'd prefer to be able to configure the camera to skip the first step altogether and jump straight to moving the AF point. The NX500 also has a useful AF Priority function that begins focusing as soon as you point the camera. Manual focusing is assisted by the 'enlarged display' function. Once you have selected manual focus mode on the lens barrel, turning the manual focus ring automatically increases the magnification on the LCD display by 5x or 8x, which is a big help in getting the focus spot on. This is real, non-interpolated magnification, very useful for accurate manual focusing - provided you find a way to steady the camera. The screen cleverly returns to normal magnification when you stop using the manual focus ring for a few seconds. The NX500 also offers the ever popular Focus Peaking assist. The start-up time from turning the NX500 on to being ready to take a photo is impressively quick at less than a second. The NX500 successfully achieves focus virtually all of the time with the 16-50mm kit lens, helped by the AF assist lamp - the NX500 doesn't have any notable problems locking onto the subject in low-light situations. It takes about 1 second to store a single full-resolution JPEG image, allowing you to keep shooting as they are being recorded onto the memory card, with a brief AMOLED blackout between each image, while storing a single RAW image takes around 3 seconds. Once you have captured a photo the Samsung NX500 has a fairly good range of options when it comes to playing, reviewing and managing your images. You can instantly scroll through the images that you have taken, view thumbnails (up to 40 onscreen at the same time), zoom in and out up to 7.6x magnification, view slideshows, delete, share and protect an image and set the print order. There are a number of different ways to alter the look of an already-captured photo, including smart filters, redeye fix, backlight, changing the photo style, resizing, rotating, face retouch, brightness, contrast and vignetting. The Display button toggles detailed settings information about each picture on and off, such as the ISO rating and aperture / shutter speed, there are small brightness and RGB histograms available, and the Highlight option makes any blown-out highlights areas flash on the LCD screen.